Diamond Pattern Turquoise Blue Woven All Wool Scarf, "Kashmiri Diamonds in Turquoise"
A refreshing turquoise hue defines this beautiful all-wool scarf from Indian artisan Sajad. The scarf is woven on a traditional hand loom in the classic Kashmiri chasm-e bulbul diamond pattern. The ends of the scarf culminate in hand-knotted fringe. 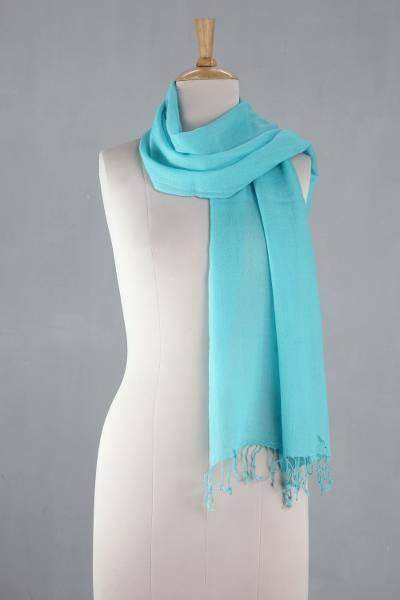 "Top quality and aesthetically pleasing"
Detailed diamond woven light weight wool scarf. Beautiful turquoise color and came with a satchel for storing. So happy with my purchase!